Shobha Tummala began her training in beauty products as early as a child in Hyderabad, India under the care of her grandparents. 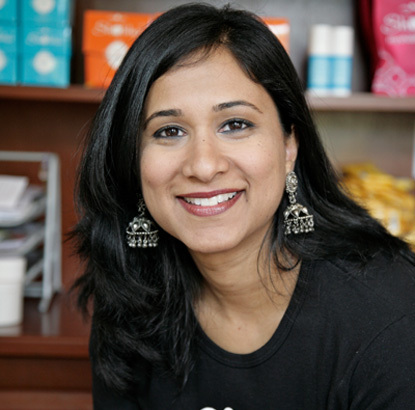 Born in Michigan, CEO and founder of Shobha, specializing in effective hair removal services and products, had her grandparents injecting natural rituals in to her daily life from the start. Her grandfather, a horticulturist, known to many farmers as the “plant doctor,” would take her on his travels to visit the different gardens throughout India. Tummala’s grandmother immersed her in India’s natural & spiritual beauty culture. As years went by, Tummala says she would spend her summers in India and it wasn’t unusual for her grandmother to scold her for not maintaining the traditional personal care she was taught. “My grandmother could tell if I had been using store-bought products from the color & texture of my skin & hair- it was unbelievable!” said Tummala. She also experienced the benefits of threading, the customary way to remove facial hair in India. It was the painless efficiency & precise definition that threading afforded made Shobha swear off wax, until she returned to the US and found there was no one in her area that threaded. Thus, the idea of Shobha was inspired! In 2001, Tummala set out to create a salon that catered to people like her, who see hair removal as a necessity in life. She wanted a place where hair removal was the main focus instead of just some add-on, haphazard service in the back room of a nail salon. She wanted to create a friendly and inviting relationship with clients so they would not feel embarrassed about their hair removal needs; a place that stressed cleanliness & sanitary practices, like no double-dipping, so they didn’t have to worry; a place that cared as much about quality & customer experience as she did, instead of the usual establishments where the technicians made it seem like they were doing her a favor. Today Tummala owns & operates three Shobha® Locations in Manhattan, specializing in sanitary hair removal methods including threading, sugaring & waxing. Shobha and her team have also begun a product line which is receiving great acclaim. Masalamommas had the chance to catch up with Tummala to talk to her about how she has juggled the challenges of being a successful entrepreneur. How did you get into this line of business and what were some of your biggest challenges? My path till when I decided to veer off probably looks very similar to most of you reading this. I got a degree in Electrical Engineering and worked for Procter and Gamble for a couple of years before venturing off to Harvard Business School. I got my MBA and was only 23 years old and too green to decide what I wanted to do with the rest of my life. So, after business school I went to what I consider post business school training and worked for Bain and Company as a management consultant. This is where I learned about how the industry you work in doesn’t matter. You can master any industry if you study it enough. After Bain, I worked at a start-up called Dash.com. The typical internet start-up experience in the late 90’s ended up being the best thing that could have happened to me. I became the process guru in the company. I loved it. I loved the whole concept of going after an idea. I loved getting stuff done and building processes to get the company to grow and expand. I couldn’t turn back and go work in a 9-5 job anymore. I had been bitten by the entrepreneurial bug. Out of that, Shobha the company was born! You’re always on call – You never stop working or never stop thinking about your work. It permeates your entire life. Work and play kind of merge together to the chagrin of my husband. For example, we were in India getting married and the day after I was out shopping for herbs to experiment with when we get back. In my defense, these herbs can only be found in India. In Goa, we got amazing facials and so I went to go talk to the manager about what herbs they use and how they manufacture their products. You get the idea. Ambiguity is your new best friend – Have to be comfortable with less structure. You have no one framing the issues you are working on or that nice structure we have when we are in school. You have to figure out what you need to work on first, second, third … You have to do that for yourself. You have to just become a Salesperson! You have to learn how to toot your own horn. You have to put yourself out there and it is hard for a lot of us to do. I think this fear is sometimes what assuages people from not doing their own thing. You will be selling this to landlords that are renting you space when you have no revenues, you will be selling this to potential employees about how it is going to be a great company before there is one, you will be selling you idea to vendors, manufacturers that want to work with big players versus investing lots of time in someone that is going to buy 500 units of something. They are looking for the 100,000 unit order. We are all used to being affiliated to big universities, big corporations, powerful institutions, that when we call on their behalf, we are used to people listening and taking the phone call. That is going to change dramatically when you start your own business. You have to be ok with finding validation for yourself with your own company even when it first starts. Let go of your ego: Take out the garbage, sweep the floors, fix the printer and fax your own stuff. You need to work around other people’s schedules. For example a writer who flew to Hollywood to meet with some producer and he was supposed to meet with him one day and he was not available so the assistant kept pushing him off and finally said his next opening is going to be next month. This guy flew home and flew back in a month and it ended up working out. He got the meeting and I am not sure if it worked out or not, but the point of the story is that type of persistence is necessary without letting your ego get in the way thinking who this person is thinks he/she is. You have to be a CCO before you are a CEO. “Chief Cultural Officer” before you are a “Chief Executive Officer” – You are the leader now and you have to set an example for your employees. You should embody the principles of what you are trying to be. I say all the time that I can’t be as good as our brand as because it is hard to be as perfect as we strive to be with the company, but you have to set those ideals and practice them if you want people to believe in them. You have to have tough skin. Especially when you have created a structure and your employees are not happy with it, but you know it is the right thing for the long run and for sustainability reasons. For the naysayers that are not going to believe in the concept. IQ doesn’t matter as much as street smarts does – I think this is always is a controversial topic, but it is one that my ex-Consultant friends that are entrepreneurs and I discuss all the time. We have been trained in environments where IQ does matter. The smarter you are at the banks and the consulting firms, the better you are going to do. In the entrepreneurial world, it requires a different type of smarts. The landlord wants to know that you are going to pay the bill because you have run a salon before not because you have worked at Bain for big multi-nationals. They are going to say yeah, but do you have experience in doing this? Thinking skills versus Doing skills – I think this is something that I learned at the start-up I worked at before I started my own company. How do you set up the structure of the company, how do you set up a website from scratch, how do you set up a bookkeeping system that works, how do you find contractors to do the build out, how do you negotiate with the contractors, the architects, the designers, the landlords, the employees, how do you set up an incentive mechanism for the employees when you are 5, 10 not when you are 500.